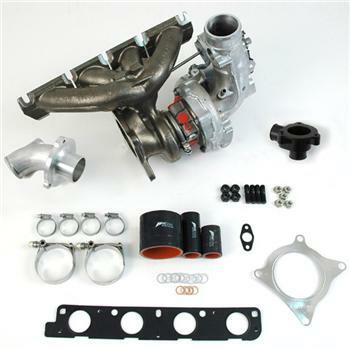 AWE Tuning Turbo - FSI K04 Kit - Dezod Motorsports Inc - Home of the automotive performance enthusiast since 2002. Using a combination of high performance OEM parts, beautifully designed solutions from AWE Tuning, and cutting edge software from G.I.A.C., the AWE Tuning FSI K04 Turbo Kit is proof that innovation can lead to premium Performance without premium price. The AWE Tuning FSI K04 Turbocharger Kit redefined the idea of what is possible from a bolt on K04, delivering 345 crank hp and 354 crank torque when used with the Audi S3 intercooler, cold air intake, S3 Injector Kit, a High Pressure Fuel Pump, and the G.I.A.C. pump fuel program. The AWE Tuning brand is about bolt-on Performance, perfect fitment, and simplicity every time. Our special adapter parts make installation extremely easy with very little modification needed to the car, our Diverter Valve adapter allows any OEM or properly designed aftermarket DV to be used, and any properly designed cold air intake that works with the stock turbo will also work with the AWE Tuning FSI K04 Turbocharger kit, again adding to the options.The elegance and simplicity of this turbo kit’s design is unmatched. Working directly with G.I.A.C. for the software version of this turbo kit, as with all our turbo products, AWE Tuning was able to retain perfect drivability manners, as well as to develop robust programming that maintains all factory safeties and emissions monitoring. The responsiveness of the turbo is well suited to this front wheel drive platform; Power delivery is smooth, with no sense of extreme turbo lag or twitchiness, which is in contrast to unsuitably large turbos that may make more horsepower, but come at the expense of low end power loss and daily drivability. Please note! Installation of G.I.A.C. software requires that you send your ECU or bring your car to an authorized G.I.A.C. install center. There is a $250 trade in discount for purchasers upgrading from G.I.A.C. K03 turbo software. We’re offering two hardware only versions of our K04 Turbo Kits, one with injectors, one without. These kits bundle the proven hardware from our 2.0T K04 Kits but leave out the rest. Please be sure you select the proper kit when ordering. Advertised power is with the AWE Tuning FSI K04 Turbocharger Kit, AWE Tuning’s S3 Front Mounted Intercooler (sold separately), cold air intake (sold separately), the S3 Fuel Injector Kit (included in kits where noted), a High Pressure Fuel Pump (sold separately) and proper G.I.A.C. software (included in kits where noted). Also, a properly designed performance turbo back exhaust is required, as is a performance Front Mount Intercooler, for safe and optimal operation of this kit. All development work was done on multiple test cars fitted with our 2.5 inch turbo back exhaust system. This kit is not compatible with the OE FSI intake. You must use an aftermarket tubular intake. K04 specific software is required to safely run a K04 turbo on your vehicle. Please note that this kit is designed to work with the first generation 2006-2008 FSI 2.0T engines.